Ummmm, sir, your head is on fire. I know, I know, it doesn’t really have much to do with video games, but I mean who doesn’t love watching movies?! (Especially the bad ones). So, if you love movies carry on reading this post. Today let's talk about Ghost Rider: Spirit of Vengeance. Where do I start with this “movie”? It stars Nicholas Cage (you may know him from classics such as Face Off and Conair and more recently Season of the Witch [HAHAHAHA!]). 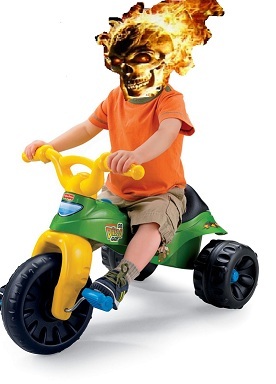 Its one saving grace is that it isn’t one of those sequels where the story is about the grandchild of the original protagonist saving the day, so right now there is no flaming-baby-skeleton-demon riding a tricycle - just yet. RUN... IT'S THE DEMON BABY!!! Nic Cage is Ghost Rider AKA Johnny Blaze. It follows from the first film with Johnny acquiring demonic powers and trying to run away from civilisation, to protect the innocent from coming to harm. 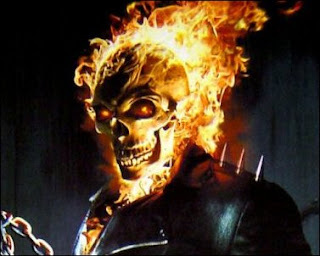 The main plot follows Johnny Blaze helping a mother and son, ultimately ending up fighting, the movie villain, Mephisto. Voila - movie summarised. The villain component to this movie, I feel, was fairly weak as it did not seem as though he had any chance to actually win against Ghost Rider. In contrast, there are parts of the movie which are done well, such as the action and the SFX. With such a stand-out character from the Marvel franchise they did well with the CGI as it wasn't too overdone. Above all the movie has NIC CAGE and CHRIS LAMBERT (of Highlander fame) in it so I’m happy. All in all, I still think you should give it a watch if you like bad movies or just like Nic Cage.